Pressure cook Kabuli chana till 3 whistles until they are soft. Drain and keep aside. Heat oil in a pan, add jeera seeds. When seeds crackle, add chopped onion, adrak and Lehsun and sauté till the onion is golden brown. Add chole masala, chilli powder, amchur powder, haldi powder, Dhaniya powder, jeera seed powder and salt and sauté for another minute. Add Kabuli chana and 1 cup of water and mix well. Simmer for 10 to 15 minutes. Keep aside. Cover with a wet muslin cloth and rest the dough for 10 minutes. Divide the dough into 4 equal parts and roll out into circles of 5″ diameter. Deep fry in hot oil till bhaturas puff up and both sides are golden brown. Serve hot with chole, sliced onion and lemon wedges. 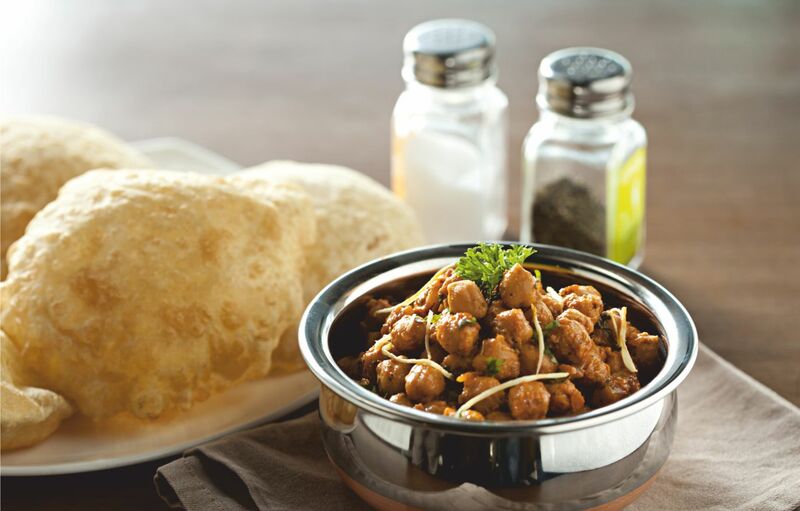 While frying bhature, press the centre lightly with a frying spoon so as to help it to puff up.